Here is Carl’s other daughter Kelsey’s graduation cake. Kelsey loves chocolate and her favorite color is blue. This cake was made in the Pampered Chef Batter Bowl (the recipe for how to do this is on the blog under “Barbie Doll Cake”) with a Dark Chocolate cake mix. It has the Vanilla Buttercream Frosting on it and then Chocolate Fondant. 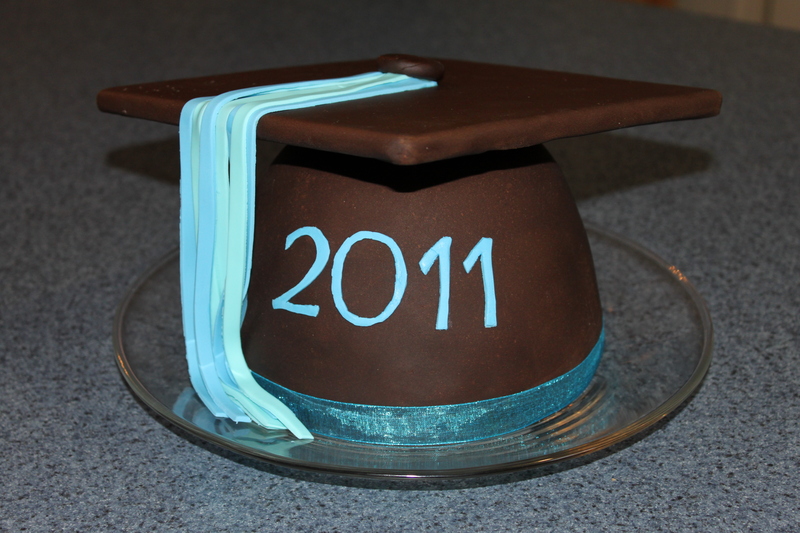 The top of the cap is a piece of foam board covered in the chocolate fondant with a Buttercream Fondant tassel. Congratulations and Happy Graduation, Kelsey! Hey Penny I would love to have you make Mckenzie a cake for graduation thursday the 2nd. Just let me know if you can and how much I owe you!!! You are amazing I hope you know that!